The season of monsoon has approached. Every one of us is a bit fascinated by this season and so are snakes. From last decade people have frequently found snakes in their surroundings. And now that it has been said, ignoring the above fact can have you pay a price. 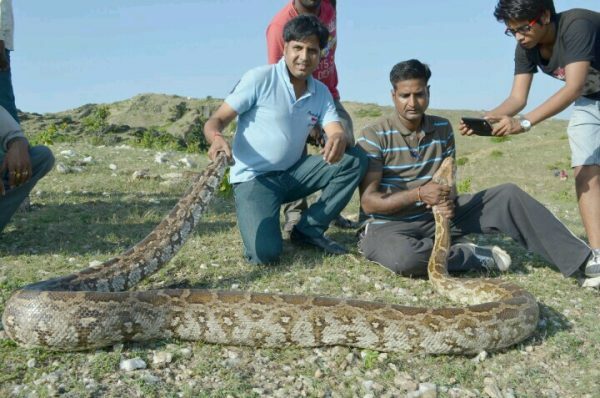 In order to make the citizens aware of the snake-related issues nearby, we had a conversation with the founder of Wild and Street Animal Rescue Society, Mr. Padam Singh Rathore. He is rightly known as ‘the snake catcher’ in the city for he has rescued an umpteen number of snakes from in and around the city. In this conversation, he shared valuable information about the concerned issue. Read along to know more about it. How did you start with the snake rescue work? About 24 years ago, I got caught in an incident where a water snake was found in the front of my house which is situated near Madar. So, when people used to fish in the canal flowing from Madar, they often used to catch snakes along with the fishes and being afraid of them, they used to kill them. I didn’t like the fact that the innocent snakes are being killed so I picked up the dead snake and observed how they are being held and how can I rescue them. Then I talked to the local snake charmers and learned the tactics to rescue snakes. I even went to Baroda to learn about the same. Then I came back to Udaipur and started this rescue work. How many people call on a weekly basis for the snake catching service? Weekly? We get 15-20 calls on a daily basis. But before we reach a place for the rescue there are certain points that we keep in mind. Like we only rescue snakes that are found in homes and public places. If they are found near farms or forests then we do not rescue them because this disturbs the ecosystem. If the count of snakes decreases near farms then the count of rats would increase. And most of the snakes found in the city are non-venomous. What difficulties do you face while rescuing snakes here? Most of the times, the distance of the location from our office is more so by the time we reach there, the snake vanishes. Apart from that, it is really difficult to control panicking people around the snake. Either they are panicking or they want to click selfies or pictures with the snake. Snake is one reptile that is afraid of humans. So when there is so much human chaos around, the snake hides somewhere and often gets aggressive. Also, ours is a 24 hours service, so it gets difficult to find houses of people during night time. Even the snake becomes less visible in the dark. What species of snakes are most common in the city and in which areas? 32 species of snakes can be found in the city out of which only 4 are venomous namely Cobra, Saw Scaled Viper, Russel’s Viper, and Krait. The old city of Udaipur from Delhigate, Hathipole, Surajpole to Udaipole is mostly snake proof. And even if there are any snakes, they are non-venomous. But with time, Udaipur has been stretching a bit in terms of area. So, the habituation of humans has reached places which used to be agricultural land or forests like Bedla, Rampura, Shobhagpura, etc.. So these are the places where the most number of snakes are rescued from. If someone finds a snake in their household, what all things should he keep in mind? The first and the foremost thing to keep in mind is to not tease the snake. Nowadays, after watching channels like NatGeo and discovery, people think that they can easily catch a snake. If you see one, click a picture of it and send it to us so that we can inform you about the do’s and don’ts related to the type of snake before we come to rescue it. And in case it’s not possible, simply call us and we’ll be there. To prevent snakes in your household, make sure to clean your garden area regularly. Remove all the burrows of rats because that’s one place where snake goes in search of rats. During summers, snakes rest in cold places such as coolers, bathrooms, wash basins, water tanks etc. and during summers, this cold-blooded animal seeks warmth near gas stoves, under vehicles, etc. Keep a check at all these places to stay safe. Where do you release the snakes after catching them? It completely depends on the kind of snake. For example, if it’s a water snake, we release it in the waters of a nearby forest, if it’s a venomous snake, then it would go in the dense forest nearby, similarly, if it’s a non-venomous snake, it is released at the beginning of a forest. This entire process occurs in the presence of forest department. Within the radius of 2 km from our office, we deliver free services. In the year, 2017 we received calls from nearby villages too. This one time we received a call from Bhopal for the rescue. At such time, we just charge for the conveyance it needed to reach there. 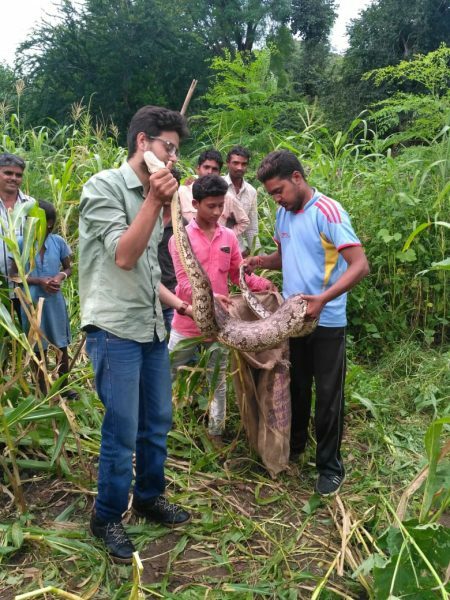 Also, it is not possible for us to go at several places at the same time, so we have taught the tactics to rescue a snake to people in Dungarpur, Sagwada, etc. It is better to be informed than to be injured. 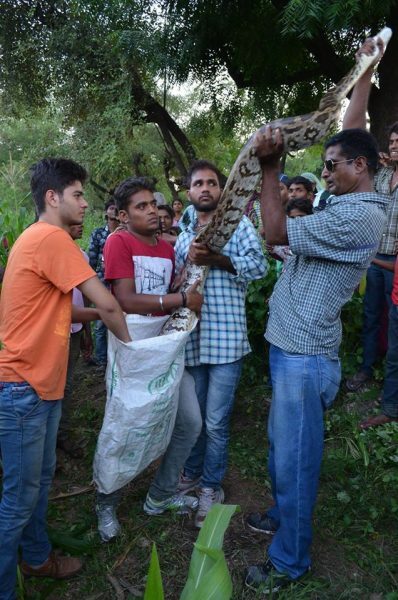 In case you are in need of a snake rescuer, call Padam Singh Rathore at 9829597722/9414234826. If you have any such valuable information that you want to share amongst the citizens, then write to me at juhee@udaipurblog.com.